Minor League Baseball has placed diversity and inclusion at the forefront of its growth strategy. We strive to create an industry where all identities are represented, welcomed, valued and empowered to enhance our league's culture, creativity, innovation and comprehensive service to the communities we occupy. We strive to be the most fun and inclusive league in all of sports and entertainment. While conversations regarding diversity and inclusion happen daily in the Minor League Baseball office and among our 160 clubs, we recognize the need to do more to elevate the voices and stories of those who currently work in our industry. The goal of this series is to spotlight the people, programs and stories in MiLB that champion diversity and inclusion and advance the mission of Minor League Baseball's diversity initiative. In recognition of Women's History Month, every week in March, we profiled a female leader in our industry. This week we are featuring the Women in Baseball initiative. 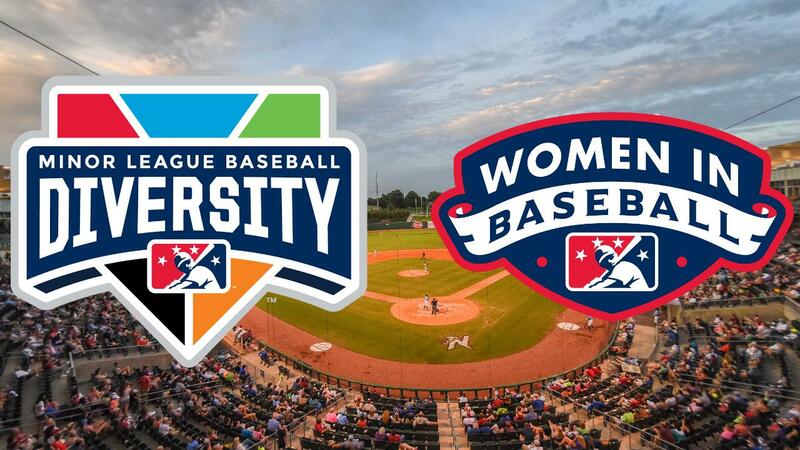 Though Minor League Baseball has dedicated considerable time and effort to its diversity and inclusion initiative, there is still work to be done on the front of equal gender representation in the industry. Still, the number of women employed by MiLB teams is growing, and Minor League Baseball recognizes the opportunity to empower those women in the way of career advancement. In 2008, Minor League Baseball executed the inaugural Women in Baseball Leadership Event. Hosted annually at the Baseball Winter Meetings™, the event provides women employed by an MiLB or Major League Baseball team or league opportunity to connect with and learn from each other through various types of programming. Past events have included a keynote speaker, a panel of industry leaders and moderated roundtable discussions. For a decade, thousands of women in professional baseball have attended the event, with the largest event to date held at the 2018 Baseball Winter Meetings in Las Vegas. "[The Women in Baseball Leadership Event] is a room filled with smart and innovative women who share a love of baseball," said Lexington Legends owner Sue Martinelli Shea. "How could I not take advantage of this amazing group? We have so many wonderful women who work for the Lexington Legends and for teams throughout Minor League Baseball. It is a great bond for us to all attend this meeting together." Recognizing that not every woman with the desire to attend the Women in Baseball Leadership Event is granted the opportunity, the Women in Baseball Leadership Committee established a scholarship in 2017 that would cover expenses for two women to attend the Baseball Winter Meetings and the Women in Baseball Leadership Event. After receiving a multitude of applications and nominations in its inaugural year, the number of scholarship recipients was increased from two to four in 2018. That means each year, four women who would not otherwise have the opportunity to attend the annual industry event can now learn and grow from conversations with their colleagues in the industry. Such opportunity is good for Minor League Baseball as it continues to encourage and uplift its women executives. In an effort to expand the support Minor League Baseball provides for women in the industry, 2018 saw the establishment of the Women in Baseball LIFT (Leaders Inspiring Future Talent) Mentorship Program. With the intention to foster empowerment of women and encouragement of each other through mentorship, the program matches MiLB women executives with four or more years in the industry with women who are new, or have served less than four years, to the industry. "Each year at the Baseball Winter Meetings, the Women in Baseball Leadership Event brings together women executives in our industry to share ideas and discuss relevant issues, but that event only happens once a year," said Mary Marandi, Minor League Baseball's assistant director of corporate communications and head of the Women in Baseball Leadership Committee. "The LIFT Program is an exciting extension of the annual event where mentors and mentees can find support and build relationships with each other all year long and, hopefully, for the duration of their careers." Though the LIFT Mentorship Program is still in its first year of existence, Minor League Baseball has received an overwhelming amount of positive feedback from its LIFTees. "I have seen a change in my confidence with my work immediately after joining the LIFT program, and I look forward to learning even more from my mentor, Kim Stoebick [of the Indianapolis Indians], and all the women in the program. It's encouraging and inspiring to have other women in the industry have your back and encourage you to be your best self," said Roxanne Grundmeier, promotions coordinator for the Northwest Arkansas Naturals. While LIFT's effects are often more tangible in its mentees, LIFTers have just as much to gain from the mentorship experience as their LIFTees. "The sports career world is small, and the good relationships will last for a very long time. The connections you make today will lead to opportunity tomorrow," said Reno Aces General Manager Emily Jaenson. "I hope to lead by example, offer advice, share my best practices and learn a little something, too. My mentee, Rachael DiLeonardo [of the Midland RockHounds], is about 10 years younger than me. That seems like a small age difference, but in the professional world I think there is a huge gap between professionals in their 20s and professionals in their 30s. She is helping me crack the code and be a better leader." Furthering the efforts made to encourage and empower women in baseball, both at the Baseball Winter Meetings and throughout the year, the Women in Baseball Leadership Committee established Coffee & Connections in 2017. An addition to the programming at the annual Innovators Summit (formerly known as the MiLB Promotional Seminar), Coffee & Connections provides an opportunity for individuals to network with each other, discuss their daily experiences working in baseball and share ideas on how to promote gender inclusion in the workplace. As an event that includes both women and men attendees, discussions promote understanding and acceptance of all genders and experiences of those working in Minor League Baseball, as well as the organization's desire and willingness to grow in diversity. As evidenced by all the mentioned programs, Minor League Baseball is committed to supporting and empowering women in the game, as well as showing young women that there is a place for them in baseball. "In this day and age, I think being a woman with a successful career in sports is more attainable than ever. I am surrounded by women who excel at their jobs day in and day out," said Sydney Glover, partnership activation coordinator for the Indianapolis Indians. An invitation to a seat at the table is the best way to show representation and acceptance in any organization. Minor League Baseball, in part through the efforts of its Women in Baseball initiative, is doing just that by showing its desire to recruit, retain and promote women. For more information about the Women in Baseball Leadership Committee, and its programs and initiatives, click here. Mackenzie Parker is an associate with Minor League Baseball. This story was not subject to the approval of the National Association of Professional Baseball Leagues or its clubs.